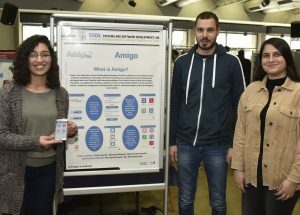 Undergraduate students from Technion’s Faculty of Computer Science presented 43 projects in the fields of Internet of Things (IoT), Android Applications, Ransomware, and computer communications. The students, from the Technion’s Systems and Software Development Lab (SSDL) headed by Chief Engineer Itai Dabran, presented a wide range of projects which spanned navigation system for the visually impaired, sensors for a karate match, a recipe search system based on available ingredients, a driving instructor’s logbook, a ‘smart’ glove for a motorcycle racing game, and a family application for managing household chores. The projects were carried out in cooperation with the Microsoft Israel R&D Center, which assists the students in using new technologies and software during the course of their studies. Guiding the students were teaching assistants Boris Van Sosin, Lina Maudlej, Ron Balter, and Ofir Alexi from Technion’s Faculty of Computer Science and Microsoft’s Director of Academic Programs, Nir Levy. Among the guests of honor at the project fair were Microsoft’s Jennifer Ritzinger, Senior Director of Audience Evangelism and Justin Garrett, Director of Academic Ecosystems for Cloud & AI. 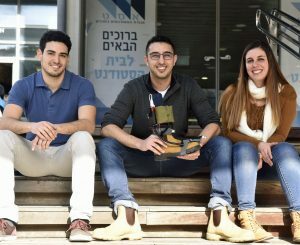 “I was really inspired, listening to the computer science students at The Technion share their projects on IoT, mobile app dev, and ransomware prevention…many powered by cloud platforms like Azure. There’s just an energy, creativity, and entrepreneurial spirit here and it’s an honor for Microsoft to be a partner here”, Garrett said. 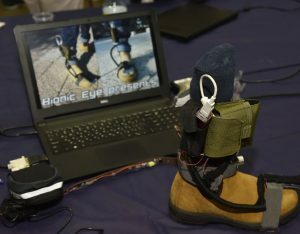 BionicEye was designed to warn visually impaired people of obstacles in their vicinity and to help them navigate their surroundings. The development team includes friends and fellow students Aviad Shiber, Shahar Shalev, and Oded Raiches. The idea for the project was initiated by Shiber, whose mother is visually impaired. “Guide dogs are a good solution for the visually impaired, but they do not know how to deal with an unfamiliar pattern,” he explained. This device helps the user navigate via the use of voice and vibrating applications that safely direct them towards their destination. DriveSafe is a system whereby ‘smart cars’ are able to identify drivers who have consumed a high level of alcohol and prevent car-ignition. The system was developed by students Rotem Samuel, Adva Bitan, and Elizabeth Langerman, and also supports tests such as the drivers’ breath and balance as well as their response in real-time. Pacmino is an innovative game based on the popular 80’s arcade game, Pac-Man. 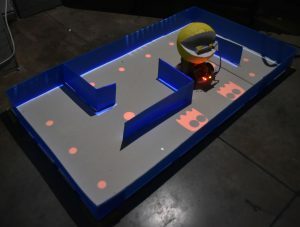 Students Ameer Dar Aamar, Samir Massad, and Khaled Manaa built a physical model of the game in which the Pac-Man is remotely controlled. The player activates and moves the Pac-Man, via on an application which implements image processing technology. 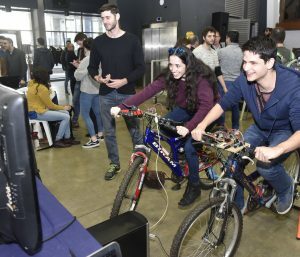 SPIN-IT students Tal Helfand, Naomi Goroboy, and Aviv Cohen developed a racing game that encourages sports culture. A pair of cyclists compete on real bicycles secured to the floor in a virtual environment; receiving feedback on their distance, progress achieved over time, and performance improvement, to encourage sports and fitness. Jesta is a social app which enables people to obtain assistance at a reasonable price. The application connects between people who need help and the relevant people who are able to help. “It is a win-win situation,” said Maxim, Chicherin, Dennis Vashenikov and Evgeni Leonti, the three team members who developed the app. The students recognize the commercial potential of this application and intend to continue its development.